Although many were relieved when December 21st, 2012 passed without any of the predicted disasters, some instead were confused or even depressed after. They wondered why they did not see through it like most people did (who may be saying "I told you so.") Certainly it is easy to negatively judge the 2012 hysteria and those who spread it as malicious or make them wrong. Yet, there is actually a silver lining to 2012 and hysteria like it. Understand four easily overlooked benefits and lessons from doomsday date hysteria to help you get past the post-doomsday date blues or the temptation to judge those who participated in it--even if that includes yourself. The 2012 Mayan Apocalypse rumors have finally come to their likely or inevitable conclusion. Failure. Nothing catastrophic happened—but there still will be negative effects to it that are easy to see. Many children and troubled teens were truly scared that the world would come to an end Dec. 21, 2012. Scientists were bombarded with time-consuming inquiries from worried members of society. Some reported that they can't eat, or are too worried to sleep. Others were even suicidal. Given such negativity, it is difficult for most to see that there are valuable lessons and benefits provided by the 2012 doomsday hysteria. What good can possibly come out of a harmful falsehood like the 2012 doomsday date theory, you ask? As the law of unintended consequences states, many effects opposite to the expected result happen in life As we shall see, this is true even with negative events from the 2012 doomsday hysteria. In this article I will list several which may help balance out any a negative perspective you might easily have about this whole debacle. The first helpful lesson to learn from 2012 is how these doomsday dates come about and catch on. Many wonder why they spread when scientists and other authorities are available to handily debunk every single one with sound reasoning and evidence. Is it just because there are always people who are crazy or nuts ready to invent and believe crazy ideas? It is certainly easy to just write off doomsday date theory phenomenon to craziness, especially if you have never fallen for one yourself. Personally, I cannot say that. I fell for Y2K in 1999 and even moved my family because of it. I saw Y2K as a possible fulfillment of what I had begun to learn in my studies of Bible prophecy. I decided it was wise to better be safe than sorry and move, just in case. Not exactly what you would call crazy. The problem that I (and people who fell for 2012 and other doomsday dates) had was inexperience in evaluating such possibilities properly. I was so focused on the real possibility that this event could and might happen that I ignored critical evidence to the contrary. In other words, I was suffering from a “confirmation bias” in my data gathering. I was not factoring in the question of how probable an event was based on past precedents. I was only concerned that it was possible, no doubt because of fear or other emotions clouding my logic. This is similar to someone not going out of the house because of the real possibility of being struck by lightning, despite the fact that the probability of that happening is so low as to not be worthy of consideration (under normal circumstances). If someone has a lightning phobia (a real thing, called astraphobia), they could also make bad decisions based only on the possibility rather than the probability. It helps to realize that everyone is at different stages of maturity and development of critical thinking skills. What is easy for one person to size up and discount, is not for so easy for another. It's the same reason that Jesus' statement “the poor will always be with you” is universally true, even when the utopia on Earth called the Millennium arrives. I know people who are simply just not good with planning, impulse control, or with numbers—all things important to managing money and making sure you have enough for your needs. As a result they are constantly short on money or in debt or in need of help. Rather than judge them for not learning the “basic skill” of handling money, I came to accept that not everyone can do what the rest consider elementary. Similarly, there will always be a segment of the population who are new to doomsday theories, or unable to recognize their weaknesses of pattern of failure or powerless to overcome fears driving them to pay attention to them “just in case.” For this reason, doomsday theories will always be. Periodically, big ones like Y2K and 2012 will build up into a global hysteria that ensnares even larger numbers of people. This leads to the next fruit of 2012 and other false predictions. For those duped by 2012, they probably felt like they wasted their time and energy researching it and worrying about it. In other words, whether or not anyone else is calling them stupid or saying, “I told you so” they already are judging themselves for their mistake. However, in my experience there really is no wasted time or experiences in life. Every idea or activity you engage in teaches you something, even the failures and deceptions you fell for. It is likely that these people learned something they needed to learn from the experience; something that those who did not fall for it already knew. When the next doomsday date comes along (which it surely will) they will probably not be as easily fooled. After enough such experiences one will come to realize that “no man knows the day or hour” that Jesus taught about his coming also applies to knowing the timing of other big prophetic events. The track record of such predictions is 100% failure. After I fell for Y2K, it really bothered me that I had been so gullible. But I was glad for what I learned from it, some important discernment. I actually realized a couple months before the date arrived that if Y2K was the fulfillment of the disasters the Bible warned about, then something was missing: any clear plan or assistance from God to save his people. Nobody could know for sure Y2K was the start of the end times nor what to do about it. So a minority of people with the suspicion it was and the wherewithal to do so moved to sustainable living situations, built bunkers, cached food and weapons, and did other things known today as “prepping.” The end result was confusion and very few being truly confident in being able to handle whatever was coming even while the majority would be caught completely unprepared. The next time I heard the claim that prophecy was about to be fulfilled and we had all better take heed and do something drastic, I knew it could not be right. When the real deal comes, God must warn and save his people properly so they all have a clear understanding and chance to be saved (Rev 18:4; 12:14). Otherwise only a minority of paranoid or prepper types will take action, just as happened with Y2K, to uninspiring results. I finally made peace with this situation when I realized something about the people who read my articles and bought my book. From my contact with them I realized that often they were people exposed to such theories and scared by them. Time after time I heard people relate that they returned to God from backsliding because of a certain doomsday fear or prophecy interpretation they heard. They began studying the Bible and even read the entire Bible at last. All because of terribly mistaken doomsday dates? We all tend to get in a daily routine and habit of how we spend time on and what we think about. We are concerned about making money, getting our needs met including having fun and making plans to accomplish it all. We naturally ignore or resist anything that might get in the way of these pursuits even if we feel guilty about not praying or studying the Bible enough. Due to the urgency of the deadlines of doomsday dates, people are finally forced to stop what they are doing and get around to spending time on these important activities and topics. In this way, doomsday dates work to interrupt people's cycle of distraction with day-to-day concerns and to look at the bigger questions in life. After evaluating things in a new light, many choose to seek God and understanding of his word in earnest. Obviously, this is a unexpected benefit of doomsday date hysteria. To be sure, one of the effects of so many failed doomsday predictions is that people become jaded against all such predictions. Overall, as covered above in the section on discernment, that is healthy as these predictions deserve to be ignored given their abysmal track record. Despite all the doomsdays that never come, Bible prophecy reveals that “the end of the world as we know it” (TEOTWAWKI) indeed is coming one day. Yet many Christians never hear about or learn what Bible prophecy says. They do not read their own Bibles typically because they trust their church and pastor to tell them what is important. But churches for obvious reasons would prefer not to teach on such negative and unpalatable topics. 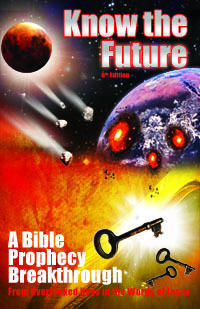 Therefore, false doomsday dates ironically serve as a first introduction to the reality of doomsday as predicted in Bible prophecy for many Christians. They finally realize that “we must through much tribulation enter the Kingdom” (Acts 14:22) also applies to the Great Tribulation (Mt 24:29-31). Of course, the major difference between the false doomsday prophecies and the Bible's prophecies is that the latter gives no comforting convenient date that you can write in your calendar. In fact, Jesus plainly states that we will not be able to figure out the time of end far in advance (Mt 24:36). Instead of watching a calendar, Jesus described certain unique milestone events to be watched for. Until those events come, we can be confident that the “end is not yet” (Mt 24:6). What are the requirements on top of being alert? 2 Peter 3:10-12 (HCSB) — 10 But the Day of the Lord will come like a thief; ... the earth and the works on it will be disclosed. 11 Since all these things are to be destroyed in this way, it is clear what sort of people you should be in holy conduct and godliness 12 as you wait for and earnestly desire the coming of the day of God. The same conduct that leads to eternal life also qualifies you for inclusion in God's escape plan from the real doomsday coming. Whatever that plan is must be revealed to all at the time, most likely through a prophet(Rev 18:4=Mal 4:5-6). No doomsday prepping required, at least not in the form of physical resources—only internal/spiritual resources. Now that's “good news,” isn't it? While doomsday dates have so far always failed, they continue to be invented and to captivate segments of the population. Rather than judge those who believe them as crazy or stupid, it's helpful to realize that some simply have not yet developed the discernment or mastery of their doubts and fears needed to properly debunk them. As such, the negative effects of the hysteria that sometimes develops from doomsday dates like 2012 is obvious. Yet the hysteria can also bring people better discernment, renewed interest in the Bible, a closer relationship with God and repentance and even awareness that one day a real doomsday predicted by the Bible will happen. To be ready for it is thankfully not nearly as hard as for other doomsday theories. It does not require special expertise on Bible prophecy or super-righteousness. It only requires us to be alert and to keep doing what we already need to do to enter the Kingdom of God, conducting ourselves in love of God and our neighbor while we await further instructions on God's escape plan for us.